India has announced a second wave of reforms by further liberalising FDI policy. The government, on Thursday, relaxed investment norms in multi-brand retail and raised FDI caps in several sectors while making it 100 per cent in telecom. The Indian Cabinet headed by Prime Minister Manmohan Singh diluted the mandatory 30 per cent local sourcing norms for multi-brand retailers. Commerce and Industry Minister Anand Sharma said the relaxation in multi-brand retail norms will give “more clarity and more space to investors”. Multi-brand retailers like Walmart and Tesco will now have to source 30 per cent of their products from small and medium enterprises only at the time of start of business. “50 per cent of the FDI in back-end infrastructure, will be of the first tranche of USD 100 million. Thereafter, this would be need-based business decisions by the investor and their domestic partner,” added Sharma. India’s $500 billion retail market is an attractive destination for global retail giants like Tesco and Walmart. 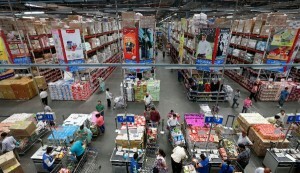 Walmart has welcomed the relaxation of norms in FDI in retail. “We appreciate the government’s willingness to consider our requests for clarity on conditions contained in the new FDI policy,” said a Walmart statement. “We are expecting FDI flows will increase and the foreign investors will have much greater confidence in the Indian foreign investment policy,” said Mayaram. In single-brand retail, FDI up to 49 per cent will be under the automatic route and beyond that through the Foreign Investment Promotion Board (FIPB) route. In basic and cellular services, FDI was raised to 100 per cent from the current 74 per cent.